Site of the former Grant Lumber Co. There was a boat launch and small dock here in the 1950s. A large crowd gathered in 1961, to watch old pilings being dynamited and cleared in preparation for hydroplane races and the Old Time Picnic. The marina was built and put in operation in 1962 by Mr. and Mrs. Albert Mault, owners and operators of the Gateway Motel on the highway. The marina included 30 slips for boats with room for 28 more. A small c-store and boat rental business operated at the dock. In 1965 the facility included a restaurant. bar, dance floor, open air pizza parlor, and 1,776 sq-ft arcade area with Frank E. Smith leasing and managing. Proprietress Glenna Ross of Springston opened a floating gem shop at the marina in 1965. Improvements were made that year to the town's waterfront area. The beach was cleaned, gravel spread, and grading done in the parking area and walkways. Electric service was extended to the restaurant building and the new floating gem shop. A new water line to accommodate the restaurant and campground was completed. Many people have taken a turn serving the summer boating crowds and trying to make the Gateway a profitable concern. In 1968 Frank E. Smith and Harry Lebsock leased the marina from the Maults. In 1973 Mr. and Mrs. James Seig ran the cafe and Mrs. Mary White operated the bar, with Evert Smith in charge of the marina. Dallas Wilmarth became the new owner in 1977. Jeff Schoeben was manager in 1979. Dave Jones bought the place in 1985 and spiffed it up with new docks, blue canopies, and renovations to the dining and dance areas. Dave and Arlee Jones were the owners in 1987. John Gish and Linda Gosset had it from 1989 to 1997, when they went bankrupt after an eight-year struggle. A flood that year, which damaged the building and gas pumps was the final straw. Dave Kelly bought it in 1999, with Rick Voss managing. Kelly paid $500,000 for the business and had to clean up the flood damage. The Spokesman Review carried an article in 2001 about Peter Cooper from Hayden, Idaho, who wanted to build a four-story, seventy-five unit motel with a ballroom and transport guests to the site in a hovercraft ferry. John Batson became owner in 2004, remodeled it and changed the name to Fox Fire Marina. A huge gust of wind ripped a boat slip cover loose that year and knocked two people into boats and two into the water. In October the Gateway changed hands again, and has remained with Dona and Jeff Hall as Gateway Marina Holdings, LLC, managed alternately by Randy "Gig" Early, Fred and Karol, Johnson, Staci Trister and Rex Taylor. Current managers are Greg and Leeann Wallace. Harrison Elevator #775 was built by E.C. Hay and Sons of Tekoa, WA, with the help of local laborers. Watching the progress of the wood crib structure rising ever higher was an intriguing pastime for the townspeople during the spring of 1955. The large grain elevator and adjoining building are set on the lower end of three lots with frontage on Lake Ave., just above the Trail of the Coeur d'Alenes, formerly the Union Pacific Railroad tracks. The building served the farming area east of Harrison by providing grain storage and shipping via the railroad. Owners added the Quonset building c. 1967 to increase storage capacity to more than 148,000 bushels. Mr. Hay owned and operated other elevators in farming communities on the west side of the lake. Before this elevator was built, some local farmers hauled their grain to Hay's facility in Worley. In the earlier days they loaded it on wagons that were ferried across to Chatcolet from a landing at O'Gara Bay. Later, grain was trucked to Worley. Architectural Features: The elevator rises four stories to a gabled roof, with a narrower section continuing another two stories and culminating in a hipped roof. The wood crib structure is clad with corrugated metal siding. A one story shed-roofed section on the west contains the scale. There is an adjoining Quonset addition on the north end. The elevator began receiving locally harvested grains in 1955. The property changed hands several times with the previous owners adding a private residence. Current owner is Joe Cornell. ​The original opera house, called the Princess Theater, owned and managed by B. S. Laferty, had a 25" x 20' stage and seated 400. In 1916, the theater heralded the arrival of spectacular and educational talking movies, and a large crowd showed up. Someone had come up with the idea of running an "audio track" on a phonograph along with the movie. It took a lot of fiddling to get the timing right, but it was halfway successful. The theater burned in the 1917 fire. By October of that year, John Nitkey announced plans to build a brick movie theater with seating for 300. He estimated construction would be complete by December. The theater was in operation by July 1918. The interior featured a stage, seating on both the first floor and balcony, and a projection booth on the upper level. The Liberty Theater featured silent films accompanied by music provided by a pianist until at least 1928. The business may have had a rocky time, however, since the property deeds changed hands numerous times in little more than a decade. Relative George Nitkey retained ownership until 1931. By 1932 the stage, balcony and projection booth were removed. James B. Armstrong purchased the theater building in 1941. He had operated Armstrong Garage in Harrison from at least 1932 to 1938, possibly several years more. Later sales of the building in 1945 and 1964 listed equipment that indicated continued use as a mechanical garage. The building was purchased in 2015 by Joe Cornell. The storage lot north of the theater building is where Grace Methodist Episcopal Church stood. This was Harrison's first church, built in 1895. The church housed the first school in the winter of 1895 and '96 with Mr Edelblute and Mr. E. W. Burleigh as teachers. Architectural Details: The two-story building is a two-part commercial block featuring dark red brick on the facade and hollow brick tile on the side walls. The lower facade, altered when the theater was converted, now has a garage door in the right half. The upper facade contains two one-over-one double hung sash windows, with two smaller window openings in the center filled with bricks. Side walls have double-hung sash windows for the upstairs apartment. The shed roof is hidden by a brick firewall. ​The original brick structure was built by the Masons in 1912, who had their meeting hall upstairs. Groceries were sold on the street level at the Davis N. Shuster Store. The building was destroyed in the 1917 fire. Before constructing the brick temple, the Masons had been meeting on the second floor of a frame building that housed a drug store and the post office, across the street from the present building on Block 10. The Masons rebuilt in 1918 and maintained a reception and meeting hall on the second story for many years. Various businesses used the retail space on the first floor. The Export Lumber Co. sold hay, grain, and feed in the basement and groceries, hardware, and clothing on the first floor. The Lodge was unable to keep up with taxes during the late 1930s and the county took over the property in 1942. Three years later, Russell & Pugh Lumber Co. purchased the building. The red jailhouse that is now on display at the Crane House Museum stood to the south of the structure. It was used for storage in the 1950s. Rudy Boat Storage and Hitching Post were there in the 1980s. At some point, the Grant Brothers purchased the building. Street level shops during the past two decades were The Steamboat Trader, operated by Pete Nikolaus, and Bev's Crafts, which opened in 1992. A wooden fishing boat Mr. Nikolaus was restoring in the adjacent lot became a much photographed roadside attraction. The building sat empty for several years. Paul Hoskinson and Shelly Low purchased the Grant Building in 2013 from the Grant family. Mr. Hoskinson accomplished extensive remodeling and opened the lower levels for business in 2014. Architectural Features: The large two-story building is set on a sloping lot so that the random ashlar stone foundation forms a basement story along the south and west sides. The upper stories of the two-part commercial block are brick, with pressed red brick on the facade and common brick on the side walls. The front of the facade includes two storefronts. Both feature recessed doorways and large windows. Before renovation, the storefront included large wooden doors that provided access for vehicles to a storage area in the rear. The second-story facade has five evenly spaced nine-over-one double hung sash windows. Brick pilasters dividing the first story into two bays have white tiles at the base and top; similar tiles appear in the lintels of the second story windows. White bricks form quoins on the second story, while soldier courses divide the floors. The metal cornice is supported by stepped brick dentils. ﻿​The City Park encompasses all of Block 2 of the original town plat. Prior to the 1917 fire the block contained ten wood frame commercial structures. None of them were ever rebuilt. Various lots passed to the county for unpaid taxes in the 1920s and 30s. 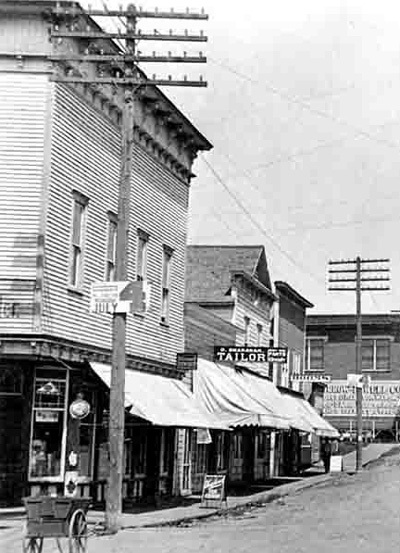 The businesses were modest enterprises such as saloons, restaurants, a meat market, confectionery, barber, cobbler, a news stand, and a boarding house, which faced Coeur d'Alene Ave. There were also at least three dwellings built on back lots. Various lots passed to the county for unpaid taxes through the 1920s and 30s and by 1939 the county held title to the entire block. The county deeded all of Block 2 to the City of Harrison for use as a park in 1945. Members of the Old Time Picnic committee cleaned up the site for their annual gathering in 1953. ​Now, most community events center around the park, with it's large shade trees, outdoor kitchen, playground, and free live music on Saturdays in summer. The stage, referred to as "The Gazebo," was completed in 1997. A true community project for which many people donated materials and labor. These are the businesses that once stood where the city park is now. The Mint is on the left. Access: Businesses/Private. Business currently in the building are: One Shot Charlie's, The Cafe, Harrison Art Gallery, O'Susanna's Design Studio, Grubby Girls Soap, and Tin Cup Coffee Shop. Private residence upstairs. The International Order of Odd Fellows building was the first substantial one erected after the 1917 fire. The main floor has held a mercantile, meat locker, post office, barbershop, hardware store, cafe, and a sewing machine manufacturer. The upper level, with its high ceilings, hardwood floors, and large windows has housed a theater, dentist office, and restaurant. The Odd Fellows were well established in Harrison by 1901 and they met on the second floor of a frame building located diagonally across the intersection, where the library is now. They sustained a $2,500 loss in the 1917 fire but quickly got to work on a fine new brick building. The cornerstone dedication on Oct. 10, 1917, attracted a large crowd and the newspaper noted that this was the first building "of any consequence" to be constructed after the fire. The new lodge hall was financed by J.M. Brown, who deeded it to Harrison I.O.O.F Lodge No. 54 in January of 1918 for $24,000. Payments proved to be difficult for the lodge and the county sheriff foreclosed on the property in 1924. The building sold for about $18,000 the following year at a public auction. In the early days there was a tavern called the Oasis in the northwest corner of the lower level. It had a sawdust floor and honky-tonk piano. Greiners grocery store was on the middle level. Luella and Ralph W. "Curley" Cope moved their mercantile into that space from 1944 to 1972. After that, Ruth and Bill Foster ran King's Chicken, a chicken joint, where The Cafe is now. The building has alternately been called the Cope Building and Foster Building. In August of 1946, Mr. and Mrs. H. C. Seymour remodeled the upper level to open the Rex theater. In December of that year, an ad appeared in the Spokane Daily Chronicle offering two Holmes motion picture projectors, sound box, amplifier, screen, and 114 seats from the Rex theater for sale. The Oasis was operated by Mr. and Mrs. Ralph Cadwallader that year. The post office occupied the area where the art gallery is now for many years. It was only accessible via the outdoor walkway, and there was a tavern between the corner and the post office. Reba and Charlie Jenicek purchased the place in 1952 and the bar became known as One Shot Charlie's. Charlie gained renown for measuring shots with a small beer glass -- hence the name. There is some speculation that the name came from the bullet hole in the window facing the lake, a reminder of the wilder days that were once common in Harrison. Royce Browning of Cataldo bought One Shots from the Jeniceks in 1974. Charlies Jenicek -- "One Shot Charlie"
Business that occupied the building in 1980 included: One Shot Charlie's, a real estate office, and King's Chicken. Jean Fish was operating the Genie Shop there in 1982. Jerry Isler and Grace Graham purchased the building in 1981 and incorporated One Shot Charlies, Inc. five years later. Ferdinand "Ferd" Henri Jean Blanc opened a sewing machine manufacturing facility on the second level in 1984. The business produced about sixty heavy duty machines, called Bulls, a year. He later moved the shop to the north end of town. Bill Stein bought One Shot's in June of 1994. One Shot Charlies, Inc. was administratively dissolved the following year. The bar was sitting empty when Robert and Peggy McClelland bought it in 1996. It was sitting empty again in 2001, after which it was purchased by Chuck Coker. ​Jan and Jim Little purchased the building from Chuck Coker in 2005 and have conducted extensive renovations. Currently, the restaurant and cafe are leased by Whitney Hruza and Jordan Hall. Architectural Features: The building has two uncommon features. It is a trapezoid rather than a rectangle. The side toward the lake is longer than the side along the principal facade on Coeur d'Alene Ave. (Hwy. 97). Also, the lot slopes so much that the building is a full three stories on the lake side and only two along Coeur d'Alene Ave. The enframed window wall design utilizes walls of fired red brick with hollow brick tile on the south wall. The main facade features recessed corner entrance set behind a large square brick pillar, which continues as a pilaster on the second story. The base of the pillar contains the corner stone with the linked ring I.O.O.F. symbol, No. 54; and the date of 1917. Pilasters with cast-stone caps frame the facade into just one bay and the side facing Harrison Street into three bays. A soldier course of brick dentils top each bay, and a simple soldier course forms the cornice band. There are three evenly spaced one-over-one double-hung sash windows in the second story of each bay, except the rear, which has two. The first story facade has large plate glass windows. A walkway on the second level extends along the north side that provides outside access to storefronts. This was the egress people used to access the Post Office. Access: Business, Private residence upstairs. Wilma Wambolt and Dean Christensen took over Rose's in 1975 when Freda Rose retired after twenty-three years. An article in the Spokane Daily Chronicle at that time compared the place to Alice's Restaurant and waitress Wendy Olsen referred to it as "the living room of Harrison." Sheryl and Jerry Kirkpatrick bought the Rose Cafe in 1994. It became The Landing restaurant in 2003 after the Wilsons purchased and renovated the building and featured sandwiches named after historical steamboats on the lake. ​Randy (Gig) Early purchased and renovated the building in 2009, and it became Gig's Landing, a restaurant and lounge. The locally-owned First Bank of Harrison was housed here until the business moved to St. Maries in 1923. First Bank of Harrison was organized February 1, 1902, with O.B. Steward as president and capitalized at ten thousand dollars and E. Barr as cashier. Addison A Crane, an original shareholder of the bank, was president from 1912 to 1915. The building was a beer parlor for a short time. It was purchased in 2003 by the Wilsons, who moved the Creamery ice cream shop from the Marler Brass building to this location. The Thiels bought it in 2015 and performed extensive renovation. ﻿Dr. John Busby built this grand Victorian home in 1904. He sold it a few years later, presumably to finance building of the Harrison Hospital on Garfield St., and a floating hospital, with which he served patients in the St. Joe River country. His clientele included railroad laborers, lumberjacks, ladies of the evening, and anyone who required his services. Dr. Busby embodied all the best characteristics one could hope for in a frontier doctor. He treated patients in his office and made house calls on horseback. He was even known to ice skate across the lake to treat patients on the west side. The doctor performed many simple surgeries on kitchen tables by kerosene light as family members assisted by pouring anesthetics and boiling instruments. The race, creed, or economic status of the patient had no bearing on Dr. Busby's willingness to treat them. All were equally cared for. Those who could not pay him in cash offered milk, eggs, home cured meats and chickens. The Indians admired and trusted him. Sometimes he went to them. If the illness required him to remain overnight, he would sleep in a teepee on animal skin hides. Other times the Natives came to Harrison with their families and waited outside while he helped the patient. He never asked them for money, but they paid him with beautiful handmade articles of beaded buckskin, such as moccasins, pouches, and cradle boards. Architectural Features: The style is Victorian with cone-roofed corner tower about 10 feet above the main roof ridges at its tip. Two large gables flank the tower with a semi-circular front porch between them. The bathroom upstairs included a flush toilet. The heat source was a large pot-bellied wood burning stove in the hallway. There was a coal burning range in the kitchen. A small cottage next door to the north served as the doctor's office. Looking east from the parsonage, across Hwy-97, one can still see the concrete stairway that led to another doctor's hospital, the Lakeview Hospital and Sanitorium, built by Dr. John M. Finney. Guests from around the world stayed at the Hotel Harrison, built by J.W. Jamison in 1905 on Lakefront, between Dr. Busby's home and the old Laundry building. The hotel had three floors and 80 guest rooms, barber shop, baths, steam heat, a ballroom, barroom, and two restaurants. A wooden boardwalk led from the hotel down to the train depot. The Ketchums, who were owners, also had a small ferry that brought people back and forth between Harrison and the Amwaco train stop across the lake. The building was razed in the 1930s and the material used to build homes up on Harrison Flats. There was also a skating rink in the area between the hotel and laundry, built by Pete the Greek. When Jim Prudente had possession of the building, he added a large apartment upstairs. Howard Russel later used the building for boat storage and it collapsed in 1968. When Harrison's first family arrived they lived in a crude log structure with a dirt floor along the waterfront while building this home. Harrison's first framed house was built by Silas W. Crane in 1891 with assistance from R. M. Wark. The Cranes lived in this house until their death, after which it passed to son William Crane, who ran his jewelry business from it. He sold to his brother Edwin, who fell behind on taxes and had to redeem the property from the county in 1931. F.W and Constance Wendt bought the house in 1936. They ran Wendt Funeral Home here until selling to Howard and Evelyn Russell in 1945. The Russells donated it to the Crane Historical Society for a museum in 1984. A spring behind the Crane House likely supplied water to many townspeople, who hauled it to their homes before the water system was established in 1901. Architectural Features: The original design was Queen Anne, which was altered, probably in the 1930s, to reflect the popular Craftsman style. The cross-gabled roof was originally shingled. Two simple brick chimneys protrude through the gable peaks. The original home featured a porch with wooden balustrade and spindlework brackets at the tops of the posts and front gable peak. Access: Organization. Harrison Grange ##422. Open to public during events. Burleigh's store, with its Rip Proof Overalls mural, survived the 1917 fire. Anna Sala used it to store salt and feed for livestock and sold groceries and meat in the adjoining building. Arthur Powell had a pool hall here in 1925. The Harrison Grange #422 bought the building in 1944. It contains the wood stove from the Beauty CCC camp. Enjoy the display of antiques and collectibles in the picture windows. Architectural Features: This building and the Marler Brass building next door comprise one commercial block with uniform cream/tan colored brick. Both bays on the lower facade have been modernized. The left contains two small storefronts with large glass windows and the right contains the Harrison Grange No. 422. The unaltered upper facade unifies the building with a soldier course, recessed panels, and tile capping the flat roof line. John A. Corskie, one of Idaho's first pharmacists, provided an array of services and products here, from first aid and candy, to Captain Billy's Whiz Bang risque' magazine. By 1903 there were several druggists in town. In addition to the Corskie's, there were the Essig Brothers, William Cope, and three men whose full names are obscured by time for now: George G., Charles C., and Hal H.
There was a restaurant and drug store herein the 40s owned by Naomi McNicol. Mr. and Mrs. Jack DeLeon opened a showroom for electric appliances with a real estate office in the rear in 1954. The building served as a cafe and gift shop after the 50s. The post office moved into the building in 1976. The cream/tan colored bricks have been painted on this one-part commercial block facade. The lower facade has been remodeled with plywood siding and large windows that flank a recessed center door. A metal cornice with dentils separates the lower and upper facade. the stepped roof line rises to a shallow peak with the firewall capped in metal. A nameplate in the upper facade reads, "Corskie." A shed roofed awning with shakes shelters building front. Dorothy, John and Jo Corskie at Harrison's first drugstore. Courtesy Corskie family photos. Access: Business. Harrison Trading Post, a grocery store, deli, bakery, and state liquor store. Wayne Bridgeman operated a hardware and furniture store here until he sold to H. D. Brownawell in 1938. Brownawell added groceries and operated the store four more years. When P.J. Golm owned it in the early 1940s, it had a pot bellied stove where people warmed themselves. It had a long glass counter and meat lockers in back. Next, the store was run by Mr. Golm's daughter and son in law, Glen and Polly Russell. Joan and John Cornell purchased it from the Russells in 1974 and ran it for twenty-eight years. Cornells sold to Tina and Mike Smythe, who ran it until 2014, when Tim and Marie Neville purchased it. Architectural Features: The tan/cream brick is used in the facade of this one-part commercial block. The lower facade features a recessed center door and large plate glass display windows. Bricks are set in a soldier course below the windows. Brick pilasters capped with tiles are set at the sides of the facade, while the upper facade has soldier course set below a simple brick cornice with dentils. The stepped roof line is capped with tiles. A new awning shelters the building front. Date of building unknown. In early times it was a hardware store. In 1946 the building was used for storing tires. During the 40s and early 50s, Jerry Chenoweth set up a blacksmith shop in the back portion. He was the last blacksmith in town. A mechanic named Mr. Schneider had a garage here, dates uncertain. Bill and Eleanor "Elie" Lamb purchased the building as early as 1966 and opened Lamb's Corral. They sold old glassware, china, furniture, silver, brass, pictures, buttons, sheet music, post cards, books, second hand, kitchen antiques, and old bottles. They sold the building in 1992 to Dennis and Marsha Liming, who originated the name Little Tree General Store. Marcia Liming ran it as a native handicrafts boutique. Keith and Cindy Shannon bought it and operated an antique shop under the same name. John Kolby opened the bike rental shop in 2001. Teri and Rusty Riberich, who own HI Water Adventures, purchased the building in 2016. Help us set the historic record straight. If you have corrections on any of these descriptions, or additional knowledge about various businesses in the buildings, and their dates of operation, please contact us. Specify the number or name of building you are referring to.